First we need to define variables “left” and “top” as integers. 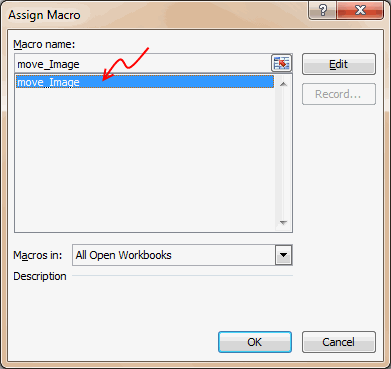 This code can be viewed by clicking on macros in the file. Once you have the code ready, you should assign it to the Rounded Rectangle 1, so that whenever you click on the rounded rectangle, the code is run. In the downloadable file in Sheet1, enter values against the Top and Left positions in the input area (blue). Click on the shape to move it to the position you have defined. Clicking on the shape runs macro “move_Image”. The value for the position of the shape is linked from the named range to the variable. The macro uses Selection.ShapeRange.top and Selection.ShapeRange.left to determine the position of the shape based on the variable value. We now know how to move objects using VBA. In the final part of the series learn how to pull all this together to create the dashboard. I got an error because "Scrolling Chart Example.xls" is not available. @Charley.. Can you explain when you are getting this error? Which file? I got an errror opening the complete dashboard file, Dynamic Dashboard Illustration V1.1.xlsm. It happened after enabling the macros, with the option to edit links. In the edit link dialog screen, there is a link mentioned "Scrolling Chart Example.xls". I could not find any formula that used this file in it. I also looked at the declared names. A lot of #REF!s in the name manager dialog screen. But no "Scrolling Chart Example.xls", as far as I could see. I sometimes get a link error in my own excelsheets and I can't find where it originates from. It looks like the source of the error is a chart, which stays linked to an external sheet. The link is not visible anywhere, so it is very difficult to find out where the link is coming from and how to correct it. The only solution I could find, was deleting the chart and making it from scratch. I get the same error when opening the Dynamic Dashboard Illustration V1.1.xlsm file. Is the Scrolling Chart Example.xls spreadsheet available for download? I was looking for the help menu as well. Luckily I found it. Here is the link to John's page. Thanks for this four-part tutorial!